For mothers of regular kids, you know that kids sneeze. Kids have snot. life goes on. With ozzie, this is usually an indicator of things to come….and this indicator came on April 1st after the photo shoot above. you can already see in his eyes that a cold is starting. For a week or so, we suctioned and kept a close eye on him, neither Brad or I slept much for that week – taking turns getting up with him. 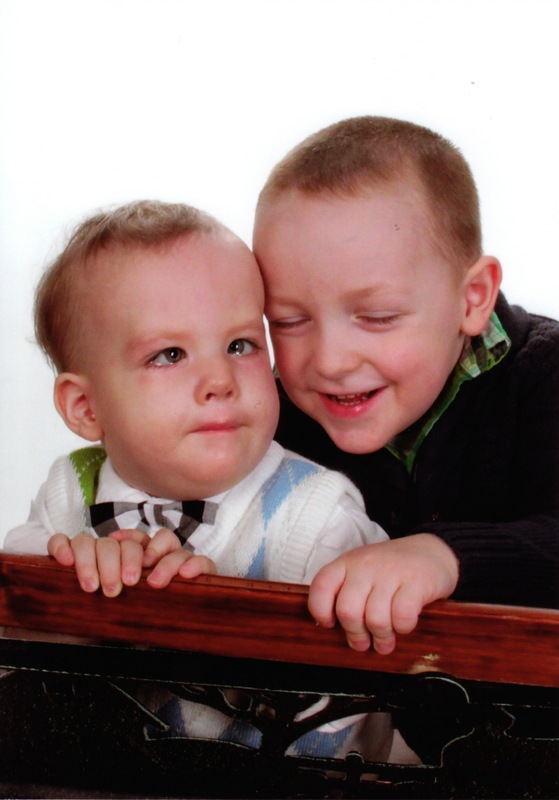 We managed to get to both sides of the family for Easter dinners, but as we were coming home from my brother’s place on Sunday night (April 8) – Ozzie just was working so hard to breathe that we decided we’d better take him to the hospital. So, Brad and Cedric dropped us off – then my Mother in law came into the city and picked up Ceddy and kept him overnight – so Brad joined us at the hospital. In the ER, they BLASTED Ozzie with puffers, giving him 4 shots of one, then 4 shots of another, every 15 minutes for an hour. They sent us upstairs for a chest xray – and Brad got to see one of these contraptions first hand. He didn’t like it. Who would? The X-ray did show a bit of something, so he sent us home for the night with instructions to pufferize him, and with a prescription for some antibiotics. Well, in the morning (Monday) we were back in ER – Ozzie had several ventalin nebulizers back to back… and it was confirmed that, yes, the poor kid had pneumonia. again. 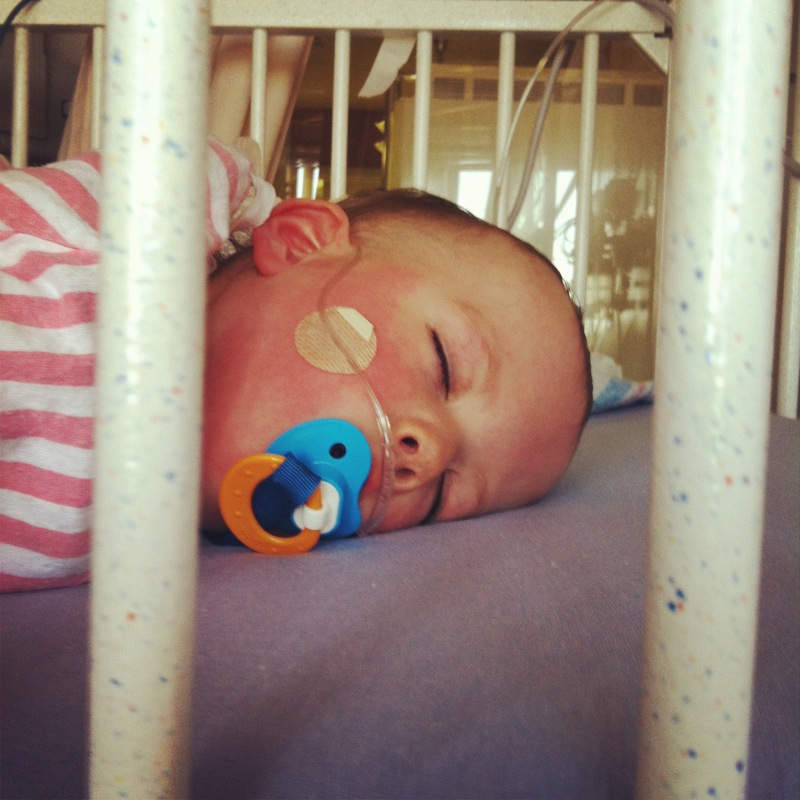 So – we were admitted and sent up to PEDS isolation….again. We ended up having to put him on Oxygen Monday night – and we began the week long process of just getting through the virus, and treating the pneumonia it caused. The virus he tested positive for was the Boca Virus. After 5 days – they eventually sent us home. Seeing as we hadn’t been hospitalized since September of last year, i guess we had a pretty good run. He’s doing much better now, but he may or may not have gotten the chicken pox last week, because the good times never stop around here.